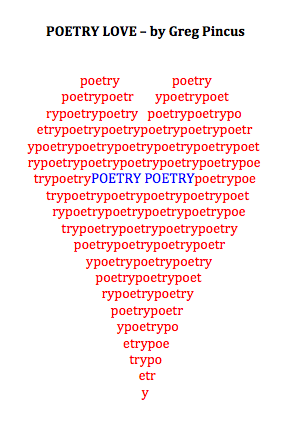 Yesterday I launched a project called Poetry: Spread the Word, and I'm really excited about it. The project needs help to succeed... yet I think it offers a lot for everyone. I'd sure appreciate it if you could go check it out. If the project is successful, the big upside on GottaBook is that I'll be posting a lot more of my poetry here all year round. Off the blog, the project will enable me to get into schools and bring poetry to kids (without the schools and teachers having to worry about how to pay me!). And everybody who backs the project gets good stuff, too. I do hope you'll take a look at Poetry: Spread the Word, and I'd be really grateful if you could be a part of it - backing the project or spreading the word. Thanks! And I'll see you here tomorrow for the kickoff of 30 Poets/30 Days! I Found Where! I Found Where! Yes, it's almost April and almost 30 Poets/30 Days time again. If you think I'm excited... you're right! Jama Rattigan has her second annual Poetry Potluck featuring poetry and recipes side by side. I participated last year and can't wait to read this year. April Halprin Wayland is, once again, writing and posting a poem a day during the month. (Are you? Let us know!). And Irene Latham will be hosting a month long "poetry party" of trivia, poetry, and lots of etcetera. 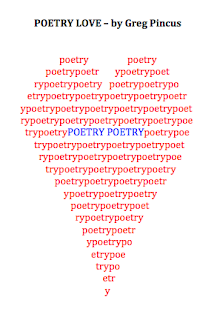 There's more going on out there, and I do hope you check it all out, share your favorite links and, as always, spread the love of poetry far and wide! Fine. I'll admit it. There's a selfish aspect of the whole 30 Poets/30 Days project: I get to see unpublished poems by all my poetic heroes arriving in my inbox! I mean, really, how lucky am I? I wake up in the morning and get to read a new Janet Wong poem. I come home from errands and Joan Bransfield Graham has sent me three to look at. THREE!! I, of course, encourage all the poets to give me options. Lots and lots and lots of options, even if I already know which poem I'm going to use. Please, don't tell them - they think it's all about the project, not about my reading pleasure. Shhhhh. The truth is that I hate the options because then I have to make choices between fabulous poem A and wonderful poem B and sometimes incredible poems C, D, E or onward. Who can make these choices? It's brutal, yet this, my friends, is the burden I take on just for you. Have I mentioned that April is gonna be a whole lotta fun around here? Sure, I'm biased... but if you were reading my inbox, I know you'd agree. When I go to children's book events, I find myself in absolute awe of illustrators. I mean, I look at their work and think "how can they DO that?" I find I'm the same way about logos and graphic design, too. This year, I was lucky enough to have the talented Mary Peterson ride to my logo-rescue. And here, as you look at it, is a bit about it: she cut the design from a linoleum block and printed it on her letterpress. Yup, you read that right: her letterpress! I find that incredibly cool. Welcome to the Web, Lee Bennett Hopkins! OK, Lee's been all over the web before, but for the first time ever, he has his own website! So, head on over and check out LeeBennettHopkins.com and learn more about one extraordinarily talented, nice, and generous man. The 2009 30 Poets/30 Days poems. The 2010 30 Poets/30 Days poems. I do so love April, and I'm really looking forward to the poems and poets of the 2011 edition, too. 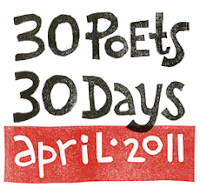 Announcing the 2011 Edition of 30 Poets/30 Days! I'm tremendously excited to announce the 2011 overstuffed edition of 30 Poets/30 Days, the celebration of children's poety that will take place here at GottaBook throughout April (a/k/a National Poetry Month). Overstuffed? Yes! Because this year, I'll be posting at least one previously unpublished poem each day each by a different poet... and many days, I'll be posting two. Why the extra? I've invited back everyone who participated the last two years to see if any of them happened to be free and able to join in the fun! How excited am I? Well, let's just say I was missing one poet when I looked at my list of who I was contacting... and I double and triple checked to figure out who it could be. Finally, I realized: it was me. Yup. I'm so excited, I've forgotten myself! The poems that are already rolling in are fantastic, so I can promise another great April ahead wherein I will get more and more excited. There are a few easy ways to follow along. You can visit here every day. You can subscribe to GottaBook via email or your blog reader. That list runs year round, by the way, so whenever I post a poem here, whether my own or a visiting poet's, you'll see it. Plus you can join the fun on Twitter. You can follow me there for links to the poems every day (and much more), or follow @30poets30days for purely poetry tweeting. A huge thanks goes out to the uber-talented Mary Peterson who has whipped up this year's logo and saving me from my own forgetfulness (she stepped into the breach on no notice and then made the whole project look great!). Talented and nice people rock, I must say - kind of the theme of generosity displayed by all the poets who join in, too, and to whom I'm incredibly grateful. And as always... thanks to all of you, because without you, we'd be writing in a vacuum (though we'd surely all still be writing!). I'm really looking forward to the month ahead, and I hope you'll join in the fun. Questions? Comments? Let me know! And if not... sit back, relax, and let's enjoy the poetry. Oooooh, you know what's gonna happen here tomorrow? Huh? Do ya? I'll be announcing this year's 30 Poets/30 Days, that's what. And I'm having such trouble containing my excitement that I'm posting today telling you. That should give a small indication of what's to come! As part of the 2011 Share a Story - Shape a Future literacy campaign, Elizabeth Dulemba asked me (and Jane Yolen, Tony DiTerlizzi, Charles Ghigna and many others) "How did you fall in love with reading?" To see the answers, head on over to Elizabeth's blog. And share some stories sometime soon. You'll shape a future! Poet, author, teacher, and person-after-whom-a-school-has-been-named David L. Harrison has an interesting silent auction item that he's talking about over at his blog: a chance to be featured on his blog and do good at the same time. It might just be a win/win for you, and it certainly will be for the Writers Hall of Fame scholarship fund. Why not go check it out? The arrival of March is always exciting around these parts... since it means we're only a month away from April. Sure, every month is poetry month around these parts, but April does bring a little extra oomph... and March finds me all excited about new projects, new ideas, and new poetry. This year should be no different around these parts. Along those lines.... 30 Poets/30 Days is coming up again (hooray, I say! ), and I've got other stuff planned, too. It's like virtual spring is in the virtual air, I tell ya! So, I'm looking forward to the months ahead, and hope you'll be sticking around for the fun.